450 Grand Concourse, Bronx, NY 10451. We are an organization of teachers, parents, and community activists who have come together to expose the attacks on public education that have threatened students, teachers and schools. 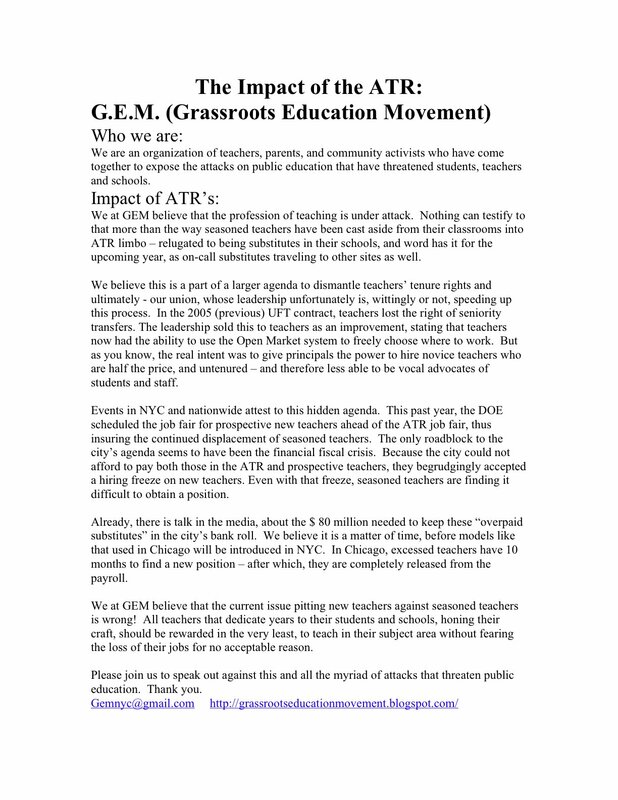 We at GEM believe that the profession of teaching is under attack. Nothing can testify to that more than the way seasoned teachers have been cast aside from their classrooms into ATR limbo – relugated to being substitutes in their schools, and word has it for the upcoming year, as on-call substitutes traveling to other sites as well. We believe this is a part of a larger agenda to dismantle teachers’ tenure rights and ultimately – our union, whose leadership unfortunately is, wittingly or not, speeding up this process. In the 2005 (previous) UFT contract, teachers lost the right of seniority transfers. The leadership sold this to teachers as an improvement, stating that teachers now had the ability to use the Open Market system to freely choose where to work. But as you know, the real intent was to give principals the power to hire novice teachers who are half the price, and untenured – and therefore less able to be vocal advocates of students and staff. Events in NYC and nationwide attest to this hidden agenda. This past year, the DOE scheduled the job fair for prospective new teachers ahead of the ATR job fair, thus insuring the continued displacement of seasoned teachers. The only roadblock to the city’s agenda seems to have been the financial fiscal crisis. Because the city could not afford to pay both those in the ATR and prospective teachers, they begrudgingly accepted a hiring freeze on new teachers. Even with that freeze, seasoned teachers are finding it difficult to obtain a position. Already, there is talk in the media, about the $ 80 million needed to keep these “overpaid substitutes” in the city’s bank roll. We believe it is a matter of time, before models like that used in Chicago will be introduced in NYC. In Chicago, excessed teachers have 10 months to find a new position – after which, they are completely released from the payroll. We at GEM believe that the current issue pitting new teachers against seasoned teachers is wrong! All teachers that dedicate years to their students and schools, honing their craft, should be rewarded in the very least, to teach in their subject area without fearing the loss of their jobs for no acceptable reason. Please join us to speak out against this and all the myriad of attacks that threaten public education. Thank you.